In researching which wooden daysailer to build. I came across Arch Davis' website and loved the look and description of his designs. I had settled on the 'Laughing Gull' but in calling Arch, which he welcomes and encourages, he convinced me that I could tackle the construction of his signature boat, the Penobscot 14, a round bottomed, lapstrake constructed boat with beautiful lines and great performance in the water. I had a local specialty lumber company mill all of the clear fir stringers, as well as the wood for other components such as the keel, deadwood, and ash for the rails. I built the construction jig first though, and this was done with inexpensive pine from Home Depot. The stem, keel and transom were done first, and the stringers and sheer clamps were the first things completed and the boat took shape, upside down as I planked the hull with okoume mahogany 5 ply marine plywood that came from a supplier in Florida. Stainless steel fastenings from West Marine and System 3 epoxy kits were used for gluing parts and sealing the wood. 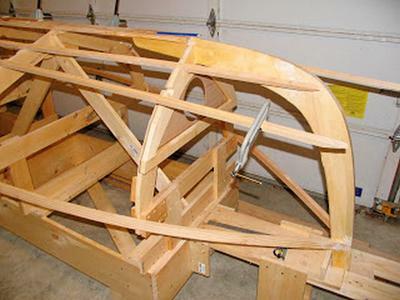 I splurged and installed African mahogany thwarts and side seats, built the centerboard case, centerboard and rudder all according to Arch's well drawn plans, building manual and video that he supplies when you buy the plans. The inboard areas were finished bright with multiple coats of varnish and the outside painted off white, except for the top most plank and molding strip which were painted marine blue and sunburst yellow, respectively. As mentioned, Arch welcomed all my phone calls and emails with friendly , much needed answers to questions about the various stages of construction that I wanted to be sure about because any thing you mess up in the early stages of building seems to greatly affect the later stages of construction. Arch told me I'd be able to finish her in 6 to 12 months but, given that I had to teach myself how to use hand tools such as a block plane, chisels, clamps of all types and had to learn how to mix and handle the somewhat toxic and messy epoxy and clear coat products,and, given that I had never built a full size boat before, it has taken me 4 years to finish her. I adhered to the principal of measure twice, cut once at all times and have ended up with what I think is a beautiful boat. I am in the final stages of getting her ready for her launching, planned for this Spring of 2012. I am about done with installing the mast partner and setting up the lug rig I have chosen. I'll buy my oars from Shaw and Tenney and am going to keep her at a marina in Deltaville, VA. where they promise safe dry storage and limitless help getting her in and out of the water. Deltaville is less than 2 hours from my home in Richmond, VA. and the Chesapeake Bay will be my sailing and rowing venue. For a detailed pictorial and written log of the build go to GOOGLE and type in MY PENOBSCOT 14. My blog should be the very first site at the top of the search.